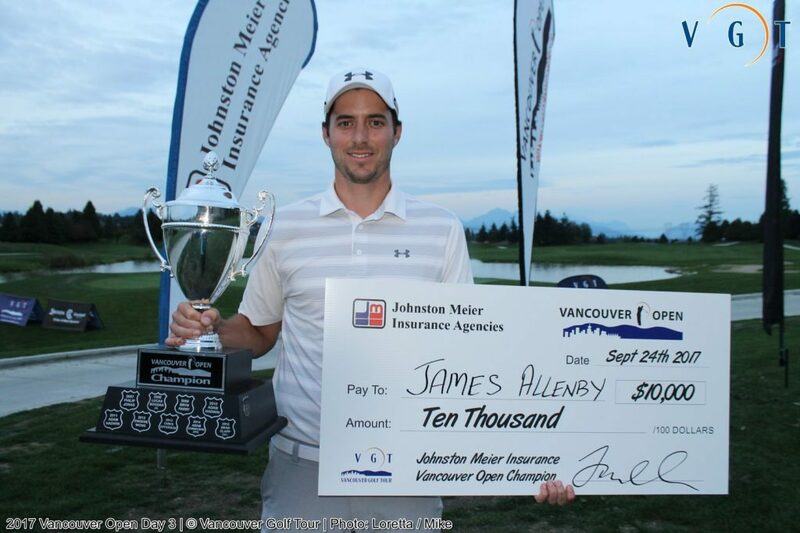 Langley’s James Allenby rose to the top against many of the PACIFIC NORTHWEST’S top Pros at the Johnston Meier Insurance Vancouver Open this weekend at Northview Golf & Country Club. Allenby’s win came in dramatic fashion, closing his final round out in style with a 2-putt birdie on route to a stellar round of 6-under par 66 and a one shot win over Victoria’s Steven Lecuyer and Oregon’s Nick Sherwood. Allenby’s 3-day total of 69, 70, 66 (-11) bettered a full field of 142 players including 48 Professionals heralding from as far east as Edmonton, Alberta to as far south as Albany, Oregon. 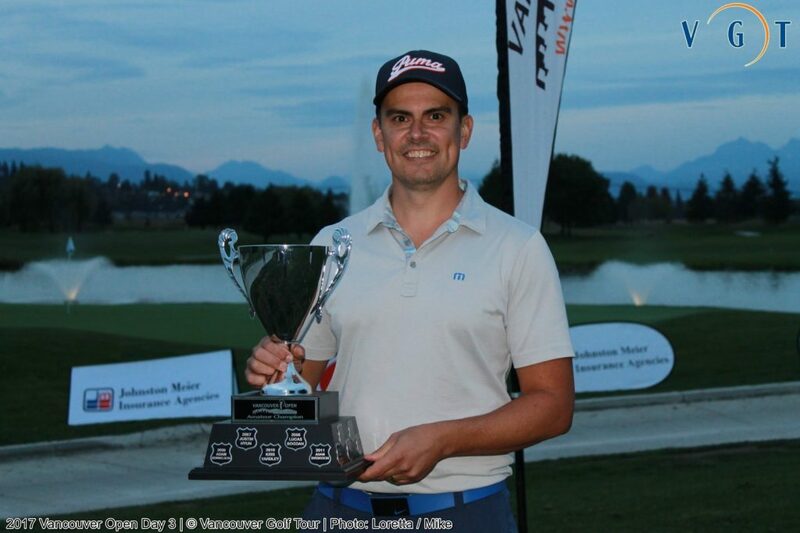 Allenby’s Vancouver Open win was truly icing on the cake for what has been a breakout season on the VGT for the 32-year old Langley Golfer. After spending almost 7 years and around $150,000 travelling across Canada to play PGA TOUR Canada, Allenby chose to take the local route to develop his game the past 2 seasons in order to have (in his own words) “a profitable season”. Setting the all-time VGT season earnings record of almost $33,800, which topped PGA TOUR winner Nick Taylor’s previous record earnings of $32,500 back in 2013. Profitability? He certainly did that. After entry fees and gas expenses Allenby netted over $28,000 in 6 months. Certainly not PGA TOUR earnings, but for a developmental tour, exceptional! Allenby will put his profits to great use having already booked his flights and paid his entry fee for European Tour Q-School. He’ll be flying to Italy this Friday to prepare for the 1st of 3 stages. Last year was Allenby’s first trip to Euro Q-School and he was successful through 1st stage at the same course he’ll be teeing-it up at starting next week. If he’s successful through first stage he will come back home for 3 weeks before fling back for 2nd stage in first week of November. Advancing through both stages would guarantee a Challenge Tour Card (equivalent of WEB.COM Tour for European Tour), but Allenby has his sights on the big stage. With the milestones he has achieved this year Allenby has shown every BC Golf fan that he definitely has the game to play on the world class stage. I am sure he is excited to prove to everyone just that, but more importantly, prove it to himself. 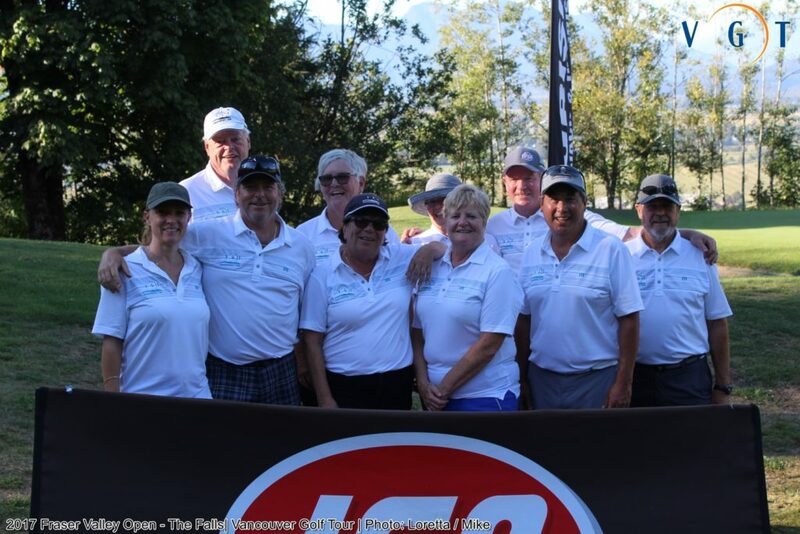 Northview Golf & Country Club played host to 142 golfers at this year’s Johnston Meier Insurance Vancouver Open including 94 Amateurs and 48 Professionals. The event could not have seen better weather and simply unprecedented golf course conditions on both Northview’s Ridge and Canal courses. Head Superintendent Dave Fehr and his team are to be congratulated on their efforts all week! And the event could not have written a better script on both the Professional event and Amateur side of the event. Not only did James Allenby write his own script birdying the 54th hole to shoot 66 on Sunday, but it could have easily been a case of extra holes. Allenby came in as the 3rd last group on Sunday and then he had to sit and wait and see if -11 was good enough to win, or at least head back down 18 for a playoff. When he holed out, at the time he had taken a 2-shot lead over Oregon’s Nick Sherwood and Victoria’s Steven Lecuyer. But Sherwood was determined to put up a fight birdying the 17th hole and would come down 18 needing a birdie and force a playoff or eagle on the par 5 closing hole for the outright win. Sherwood’s long iron approach came a yard from splashing in the water. But it didn’t. It left him hope. Get up and down and force a playoff. Chip in, and win. He executed the chip shot as good as any PGA Tour player up the slope of the green. It did not find the hole, but it left him no more than 4 feet for birdie and a trip back down 18 for a playoff. He stroked the putt and to his dismay the putt did not take the break he anticipated, and he would fall 1 shot short of Allenby. With Lecuyer par-ring the 17th, he now needed eagle on 18 to force a playoff. After a perfect drive down the middle, Lecuyer took dead aim at the back right flag. His iron approach pierced directly at the pin but pitched into the slope of the green. He was left with 40 feet for eagle. His putt raced up the hill with enough speed and for the longest time appeared to have a chance to go in. But then a few feet away veered right and missed. And just like that James Allenby was crowned the 2017 Johnston Meier Insurance Vancouver Open Champion!! His name will be etched in history right beside last year’s Champion & 2017 PGA Tour Winner, Adam Hadwin. And with the form James Allenby has shown this year there is no reason whatsoever we won’t be saying that about next year’s Champion being etched alongside European Tour Player James Allenby! All the best at European Tour School James. You really belong out there! On the Amateur side of the Championship the conclusion would be just as dramatic. Thirty-six hole leader Brad LePage from Beach Grove appeared to be in control for his first Amateur Title at the Vancouver Open. He did plenty of good on the final day carding 4 birdies on the day, but as he admitted after the round “losing 4 balls in one round just wasn’t good enough to put Kevin Hogg away”. Hogg started his round on the 10th tee on Sunday trading off a couple of bogeys with a birdie before his round started to catch fire on 18 where he made eagle 3. Although he stumbled with a double bogey on the 2nd hole (his 11th), Hogg finished in clutch fashion birdying 3 of his final 7 holes to edge LePage by 1 shot and claim the Amateur Title. Not only does Hogg get his name etched alongside 3-time Amateur Champion Adam Svensson, but it capped off his golf season in style making for his 3rd Amateur Win this year. Congratulations Kevin!! Along with over 40 players with Golf Canada factors under 5.0, the net portion of the event was contested by all 94 Amateurs. This year’s champion came from the A Flight (5-10.0) with Semiamoo Member’s Major Lidder firing some amazing rounds of golf for a 203 total of -13. His nearest competitor in the Overall Net Championship came from Jordan Reid at -8. A total of $35,000 in Pro Money was up for grabs at this year’s event including a $5,000 purse at the MAUI JIM Charity Pro-Am to benefit THE FIRST TEE of VANCOUVER. And a total of $30,000 in Amateur tee-gifts and prizes were taken home by over 180 Amateurs who attended the Pro-Am and 54-Hole Championship. We would not be anywhere without the continued dedication and support of some of the greatest people to work with period. A very special thank-you to each and every one of the Core VGT Team including our dedicated and knowledgeable Rules Staff for enduring some very long hours this year and throughout the Championship. And to all the new and returning volunteers at this year’s event, we can’t thank-you enough for your assistance in making this year’s Vancouver Open a truly memorable one for all the players and fans who came out to support. As mentioned above, Northview Golf & Country Club was showcased in all its beauty this week right from the get-go. 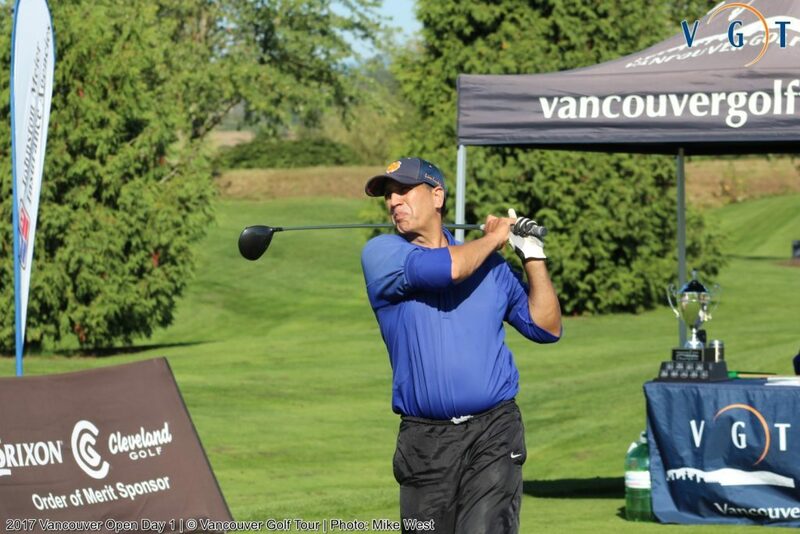 All 250+ players were treated to some of the best fairways and green conditions we have ever seen in the 11 years of the Vancouver Golf Tour’s history. What a treat for our golfers. Exceptional work!! Our hats off to the Northview owners and staff for welcoming the VGT and this year’s Vancouver Open with open arms. Your team did an amazing job of hosting and assisting our team with its operations at a very busy time in your schedule. You were a pleasure to work with and we appreciate all the support we were given throughout the week and over the weekend! Top notch service! Without players there are no tournaments. Thank-you all 257 golfers who participated in either the Charity Pro-Am or the 54-hole Championship (some both). Your support of our event(s) is greatly appreciated and we hope you thoroughly enjoyed yourselves at this year’s Championship. We look forward to hosting you, your friends, family and followers at future Vancouver Open Championships! Until the announcement of our 2018 Vancouver Open is made, thank-you all who made this year’s Johnston Meier Insurance Vancouver Open a huge success! Event Results, Prizing an Pictures: Click here.